"It frequently happens that talking about fresh fashion business ideas is the best way to fall in love with the industry again." - Jennifer Pilkington, Managing Director at RETAIL ASSEMBLY Inc. I will always tell you to know your customer and their business. Listen to what they say, as well as what they don’t say to you. Most customers and prospective customers will give you honest responses and feedback. The easiest way to get in – make sure you are aligned while staying true to your brand. "You don’t know how big you can be without trying." I also encourage many entrepreneurs to seek meetings and appointments with the large brands / retailers at the top of their game. The feedback you will get is likely to be high quality, and you don’t know how big you can be without trying. But even the most progressive organizations may take a bit of time. Fashion is an industry with a reputation for constant evolution, sometimes it can seem like a slow moving beast. An organization or professional who initially said “no” to you may change their response to a “yes” a few seasons in the future. Stay in touch with any organizations that are open to it, and those you know will make good partners. Two-year-old Board of Trade Co. now puts an equal focus on men's clothing, women's clothing and art objects in it's Gastown story, owner David Lin says. The No. 1 mistake small retailers make in preparing to combat incoming large U.S. stores such as Saks and Nordstrom is underestimating the big chains’ strength in service and technology. That competition is about to get even stiffer in Vancouver with Hudson’s Bay’s $2.9 billion U.S. purchase of luxury retailer Saks. Hudson’s Bay has said it expects to bring the brand to Canada. 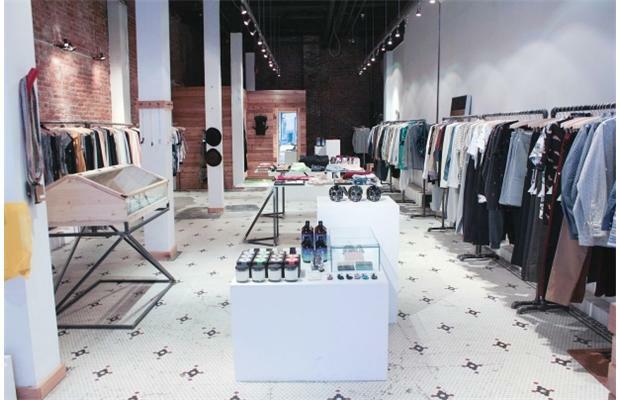 Most boutiques offer great, friendly in-store service for consumers but larger retailers are really stepping up efforts in the after-sale period, according to retail consultant Jennifer Pilkington of Toronto-based Retail Assembly. Great in-store service is now a “bare minimum expectation,” said Pilkington, in Vancouver to present a workshop at the KnowShow lifestyle trade show for retailers, today to Thursday. Large retailers are fast becoming experts at after-sale followup, using consumer data and technology to recommend additional products and provide quick delivery and customization of product, she said. In-store digital tracking is also gaining ground. Stores are tracking consumer’s mobile devices as they shop. Spending 30 minutes in the shoe section may soon trigger a discount coupon direct to smartphone. But that’s not to say small retailers cannot compete. Pilkington has identified a number of Vancouver independents who are making all the right moves in the face of incoming competition. Vancouver’s Board of Trade Co sells menswear, but also a candle or two, driftwood clothing hooks and a doormat. Cultural curation, a buying strategy that tests and offers product categories outside the core business, is a strategy where small retailers with small order sizes have the advantage, Pilkington said. Two-year-old Board of Trade Co. has found this strategy so successful, it now puts an equal focus on men’s clothing, women’s clothing and art objects, owner David Lin said. Items for sale may include handcrafted letter openers from the Sunshine Coast, designer ceramic tumblers from New York and drop-crotch pants from New Zealand. Something must be working because Board of Trade Co opened a second Vancouver store in January. Interior of the Roden Gray men's boutique in Gastown. Roden Gray has responded to growing competition by ever-more-tightly targeting its ideal customer, placing strong emphasis on branding a Roden Gray style, and is remodelling its online store for a less corporate look. Roden Gray men’s boutique has responded to growing competition by ever-more-tightly targeting its ideal customer, placing strong emphasis on branding a Roden Gray style, and is remodelling its online store for a less corporate look. Surprisingly, the physical store benefits from high-end department stores carrying the same product, Rob Lo, Roden Gray co-owner and creative director said. The additional product exposure seems to help, while Roden Gray’s skill and emphasis on showing the customer how the product fits into his lifestyle leads to sales. Recent installations include a wooden house and an environment with knotted mountain climbing ropes. Big retailers will always have the best-selling items in-store and often at reduced prices, Pilkington said. They will also offer much of a collection’s line. Where smaller retailers can excel is in offering the best, and often unique, pieces from a collection along with the best pieces from other collections. Lo and partners Davie Fernandes and Ken Wai value social media for passing styling ideas on to customers. Roden Gray’s business is increasing 10 to 25 per cent per year, Lo said. The eight-year-old store has 3,000 square feet and 12 employees. Many retailers believe they understand their customers aesthetically, Pilkington said, but it’s also important to know them in terms of what products bring the most sales and at what price points. Many smaller retailers will know that shoes, for example, do really well for them, but they may be mistakenly devoting too much floor space to them, Pilkington said. Shoes may represent just 10 per cent of overall sales dollars compared to, say, 30 per cent from denim. “You need to be buying only 10 per cent in shoes. And if denim is experiencing growth, maybe that moves from 30 per to 35 per cent of your assortment,” she said. Other Vancouver stores Pilkington expects to thrive in the new competitive environment include the sneaker store Livestock, which is so well targeted it can focus entirely on its product and simply present row after row of sneakers; Nineteen Ten Home Boutique gets away with offering everything from home products to children’s toys for the same reason; Aritzia offers product nobody else has by designing in-house and interpreting trends. While few shoppers will ignore a great discount, Pilkington sees evidence that a growing proportion of customers don’t mind paying regular price and buying less, instead. Retailers who put value back into their products by differentiating their assortments, editing and merchandising well are more likely to succeed, she said. Small retailers need to make sure their “edit” is strong and that they think critically about what they are saying about the brand that is different from what everyone else is saying.